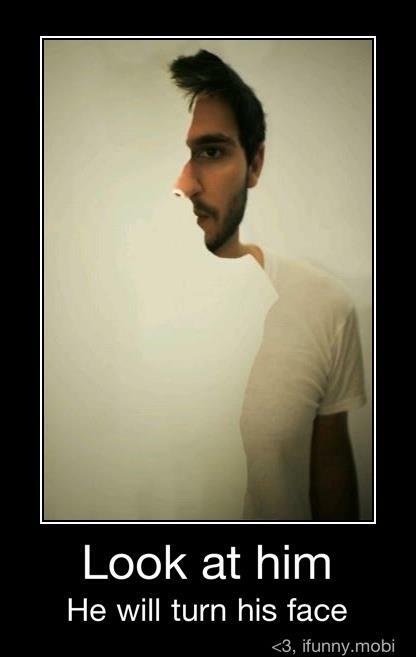 I love optical illusions, and this one was new to me. We’ve all seen the cups that become a couple or the old woman in profile who becomes the young Gibson girl turned away, but I’d never seen a trimmed photo that does this. Kind of freaky, huh. This entry was posted in Writing and tagged optical illusions. Bookmark the permalink. I love these! Haven’t seen this before though — where did you find it? Is there like a secret database somewhere? I have a small collection of them that I’ve acquired here and there, and there are some big on-line collections that are more than variations on impossible figures, which I found by Googling. This one I found on Facebook. I should post some of the others. There’s a really incredible tromp l’oeil (sp?) installation that you have to look at from the right angle to see the illusion. I should find all the bits for it and share. That was Great! Thank P.D. for sharing! Hee, I have some others that will make you go @_@. Glad you liked. That was truly Amazing P.D., I’ll be LQQking forward to if you post others.